Hundreds of comments, thousands of likes, millions of followers – the world’s top social media accounts seem to do it all so effortlessly. Is there a secret to their success, or is it just a case of being in the right place at the right time? The truth is that it’s a bit of both. Okay, so you can’t turn back the clock and dominate Facebook in its infancy. 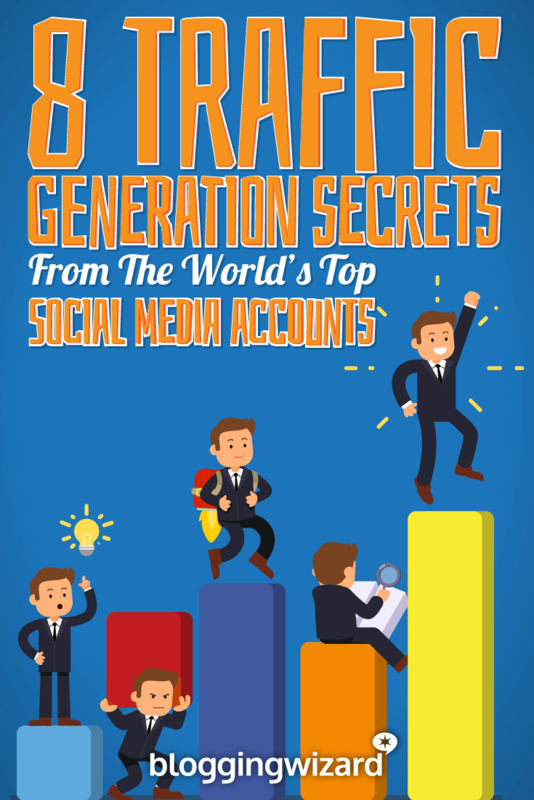 But, you can borrow some secrets from the world’s top social media accounts to grow your audience and get more eyeballs on your content. In this post, I’m going to show you exactly what the world’s biggest social media accounts do right, and what you can learn from them. This post is broken down by social network so you can find the examples and strategies that work best for your favorite social network. Use the table of contents below to jump to the relevant section. Instagram is a tough nut to crack, but it can also be wildly lucrative. With over 800 million users, it is one of the largest social networks in terms of overall reach. And since it’s highly visual, it is the perfect platform for building a brand. And on a side note, it’s also the social network I prefer to spend my time on from a user perspective. On paper, content curation sounds like the easiest thing in the world. Just select a bunch of images/videos, add publish them via your favorite social media management tool, and you’re done. But, it turns out that curating the right content is incredibly hard and requires that you not only know your audience, but your business as well. 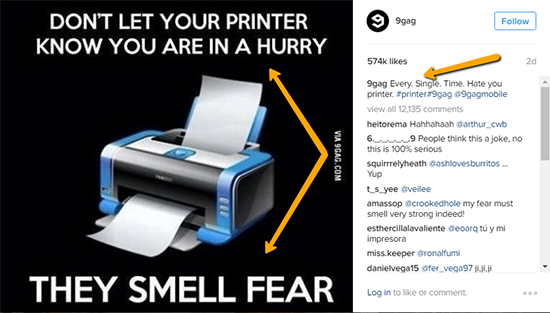 With over 42 million followers, 9Gag is one of the top 50 accounts on Instagram. Ahead of the likes of Lady Gaga and David Beckham. It is also competing in a tough niche – “viral content” – against thousands, if not millions of similar accounts. 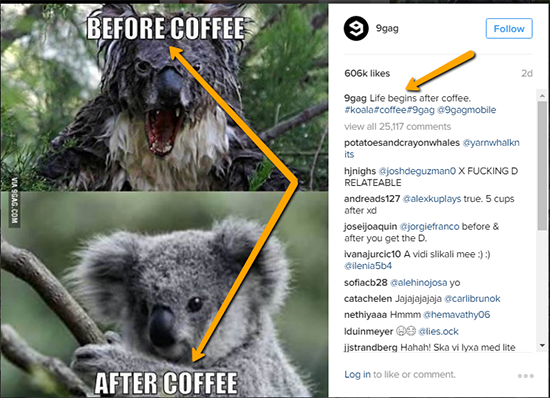 Instead of simply curating the “funniest memes and images (a subject definition at best), 9Gag focuses on curating visuals that aligns with its target audience: regular folks who want a quick laugh. 9Gag avoids obscure references and niche jokes. All the content they curate is designed to appeal to as many people as possible, without antagonizing anyone. A malfunctioning printer is something most people can relate to. Can you? I sure can! Especially wireless printers. The joke is mildly funny at best and harmless at worst. It’s the next Louis CK special, but 9Gag knows that people scrolling through Instagram feeds don’t necessarily demand meaningful insight. More than 54% of all Americans above the age of 18 drink coffee every day. So, my opinions about coffee aside, this image has substantial appeal and it’s highly relatable. 9Gag also shares content regularly. At the very least, 9Gag shares 10-12 image posts every day, spread throughout the day. It also shares 2-3 video posts. This is important since it ensures that its updates show up at least once in its followers feed if they check their IG account just once a day. Take the time to truly understand your target audience and the kind of content they like. Curate only content that directly appeals to this target audience and is easily shareable. With Instagram’s visual focus and youthful audience, you’d think that standing out requires you to be loud and belligerent. Throughout its history, National Geographic has been known for its dramatic use of photography while reporting on subjects ranging from wildlife, geography, history, and culture. This photography-centric content makes it perfectly suited for Instagram. Sure enough, it has one of the most successful Instagram accounts with over 80 million followers. According to one source, it gains over 20K followers every day on average. 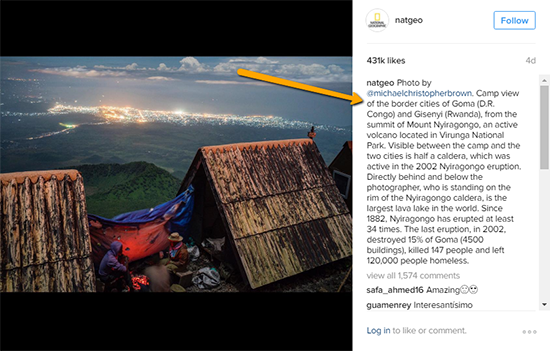 While these are massive numbers, what’s even more interesting is how NatGeo sources its content. This gives NatGeo’s updates a very personal touch. Stunning image that immediately captures attention. A sentence-long description of the image. A paragraph-long description of the image’s subject, its history and geographic/historical/environmental significance. The length of these updates goes against the conventional advice of keeping updates short on social media. 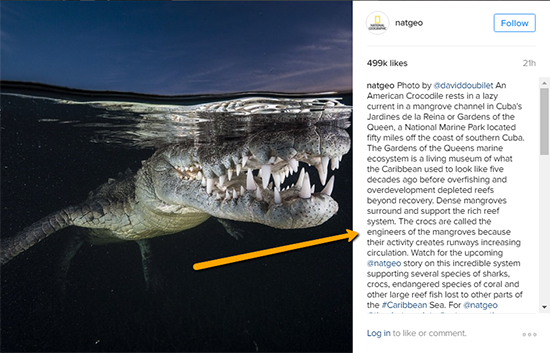 But, it works for National Geographic since it knows its users are curious about the world and want more than a pretty picture to keep them interested. Long content can work, provided you complement it with stunning imagery. Source content from multiple authors/sources to develop a sense of authenticity of your updates (get permission and give credit, of course). There are a bunch of tools that can make managing your Instagram account easier, learn more in this post. Despite recent bumps, Twitter continues to remain one of the world’s most popular social networks with over 330 million monthly users. To drive traffic through Twitter, you’ll need to create valuable content, post consistently, and engage with your followers to build relationships. 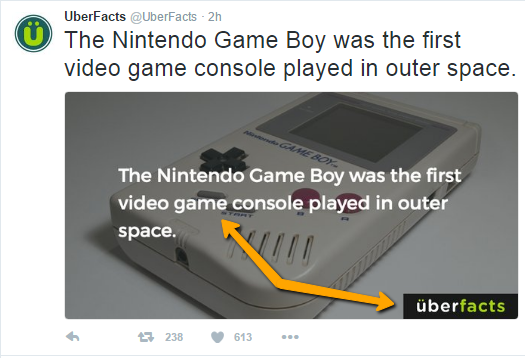 UberFacts offers its followers random facts. It started off as a Twitter handle by a then 19 year old college student. Today, it has a website and mobile app. Oh, and 13.5 million followers! A fact posted as an image or an infographic. The UberFacts logo on the image. A plain text tweet making a statement about the fact. 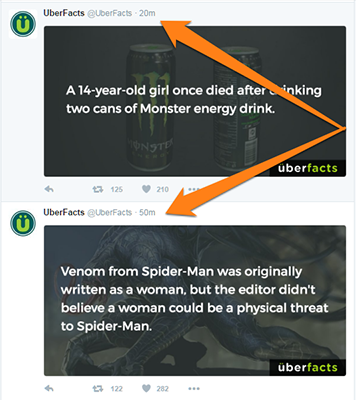 Before Twitter started showing images inline, UberFacts limited itself to plain tweets alone. However, since images are 34% more likely to get retweeted than tweets with no image at all, most of UberFacts’ updates now have an image attached. The use of the UberFacts logo on each image ensures that anyone resharing the image will spread the UberFacts brand. And, it subtly reminds viewers that the company is synonymous with interesting facts. 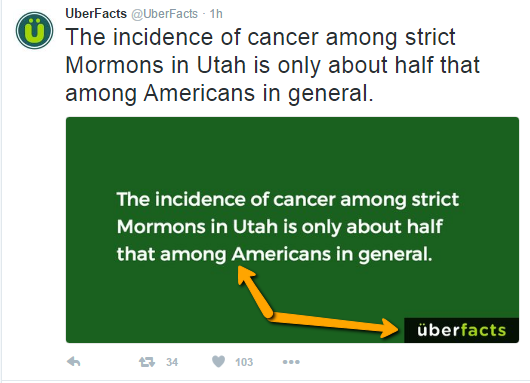 What stands out is the sheer volume of UberFact’s updates. Forget 2-3 updates a day – they do that every hour. It’s not unusual to see 5+ updates/hour. This isn’t accidental. It’s because the life-span of a tweet is notoriously short. And it’s not surprising when you consider that your followers are constantly bombarded with updates. So, it’s smart to throw together as many updates as is reasonably possible. You might annoy some users, but it’ll increase the likelihood that you’ll be able to reach the majority of your audience. On the flipside, publishing so frequently on a network like Facebook wouldn’t be recommended (we’ll talk about Facebook specifically later on in this post). Image updates stand out in the Twitter feed – use them generously. Tweet multiple times each day to capture as much attention as possible. Thanks to its popularity with journalists, Twitter has positioned itself as the go-to source for exploring current events and trending topics. 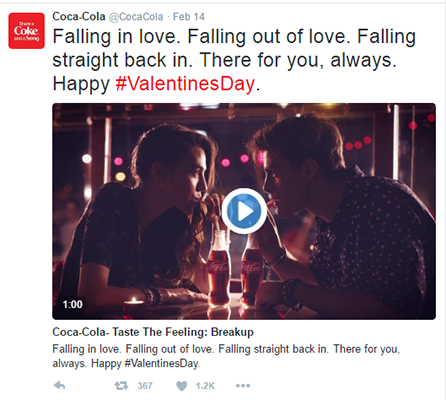 Coca-Cola takes advantage of this by tailoring its content to match these events. 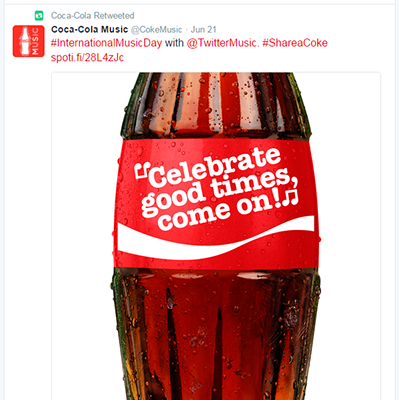 Because Coke already has a massive existing library of content, it is easy for the brand to jump into a trending event and offer relevant content, usually with the clever use of hashtags. This aligns with Coke’s brand message as well. 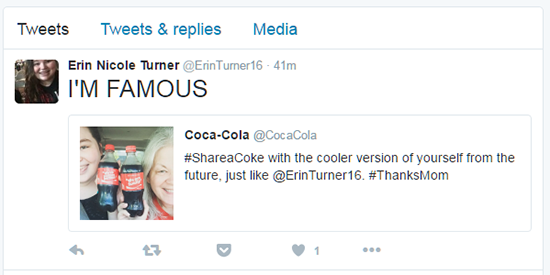 All of this ensures that Coke is seen on every search for a major event or hashtag. 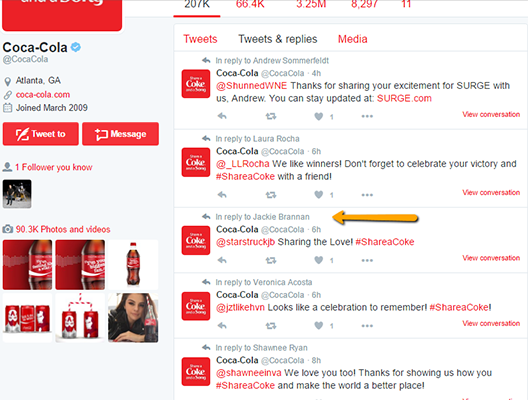 And for Coke, this visibility reaps rewards in the form of brand recognition. 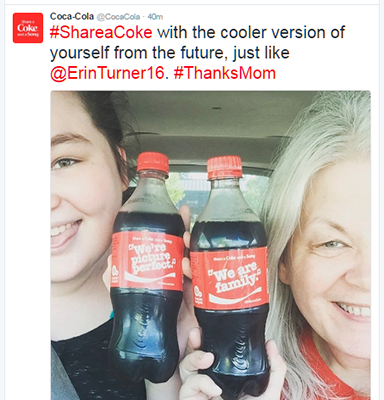 When someone shares images that help the Coke brand, the handle will reshare them as well. This helps establish Coke as a friendly and approachable brand. It also earns them a lot of love and goodwill from the original sharer. 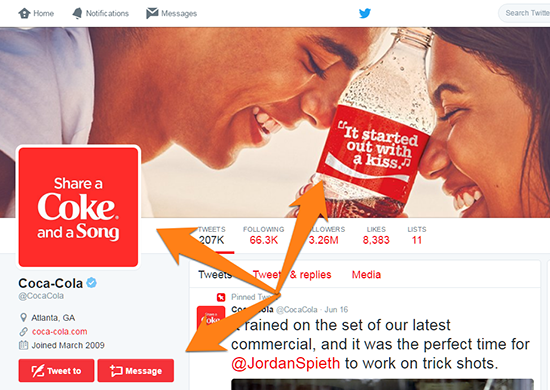 And, every element on Coke’s Twitter page aligns with the company’s brand guidelines. This is another subtle tactic that pushes the Coke brand. Associate your brand with trending topics and events that have emotional significance to your audience (such as Valentine’s Day or Mother’s Day). Change your Twitter account design to fully match your brand guidelines. Show that you are friendly and approachable by responding to queries and questions. On a side note, if you want to squeeze more results out of Twitter, be sure to check out our post on the best Twitter marketing tools. 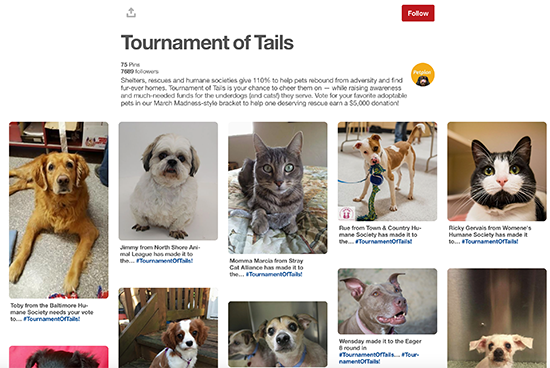 Pinterest has proved itself to be a popular platform to showcase and share content. Though initially viewed solely as a visual discovery platform, brands and businesses have quickly discovered its incredible potential. L.L. 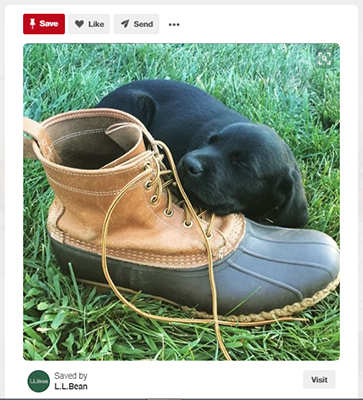 Bean, which makes outdoor equipment and boots, has one of the most popular accounts on Pinterest with over 5 million followers. With hundreds of pins spread across dozens of boards, it’s pretty much the template for successful Pinterest marketing. A few things are obvious from the start such as L.L. Bean’s website address and hashtag in the bio. But what’s not so obvious is how this brand meshes its own product-focused imagery with customer-focused images. For example, on this board, L.L. Bean has saved images from its own site as well as blogs across the internet. 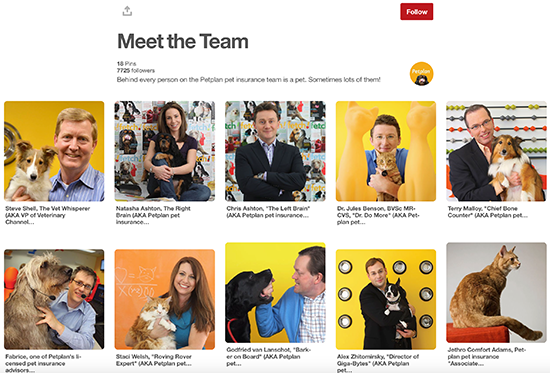 I also like how they weave two of the internet’s biggest obsessions – puppies and cats – into its pin collection. It has two boards – “Best Friends” (for dogs) and “L.L. 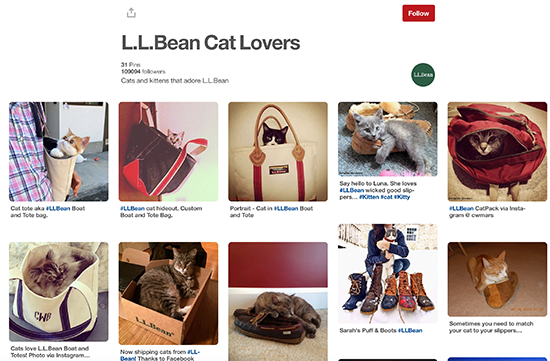 Bean Cat Lovers” – that curate pet pictures from across Pinterest. These are also among the company’s most popular boards with well over 100K followers for each. This is a smart way to tap into trends the internet cares about. Dogs and cats don’t necessarily fit into the L.L. Bean product catalogue, but by curating this type of content, the company aligns itself with the very vocal demographic of pet lovers online. Try doing something similar with your products. If you offer services, there’ll be a slightly different angle you can take that should be equally as effective. Curate content that is relevant to your niche. Align your products with internet trends. On each board, maintain a healthy balance of pins from others and your own website(s). Insurance is one of the most difficult things to sell online. For one, there is no real way to differentiate yourself. The “product” you’re selling is effectively invisible. You can’t show off its features or superior design. And because of this, most insurance companies compete in a race to the bottom with their prices. Especially with the rise of comparison websites. 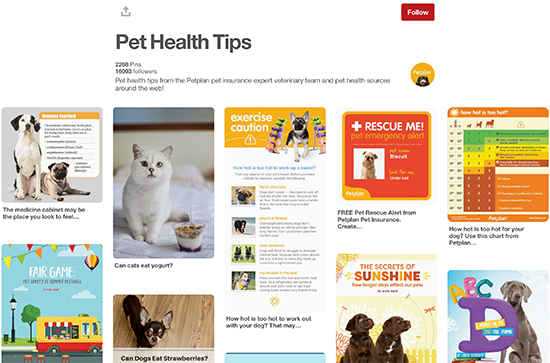 Petplan, which sells pet insurance, counters all these problems through its Pinterest boards. Instead of direct selling, it aims to differentiate itself by being informative and entertaining – a far cry from the search-focused approach of most of its competitors. This shows followers that they’re dealing with real people, not just some monolithic organization. Humanize your business by sharing pictures of you and your team – this should go beyond social media and be baked into other aspects of your digital marketing strategy. Focus on educating readers by curating tips and useful pictures directly onto Pinterest. 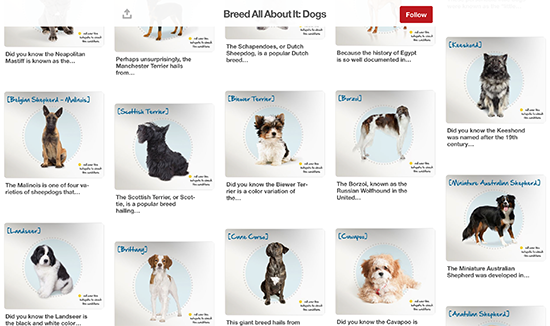 Create topic specific boards (such as “Pet Health” or “Dog Breeds”) to educate readers but ensure there is a tie-in to your business. There are a bunch of useful tools that make scheduling content & growing your audience a lot easier on Pinterest. Learn more in this post. Despite being over a decade old, Facebook still has the largest reach of all social networks. If you want to make an impact and drive large amounts of traffic to your website, you’ll definitely want to be on this platform. 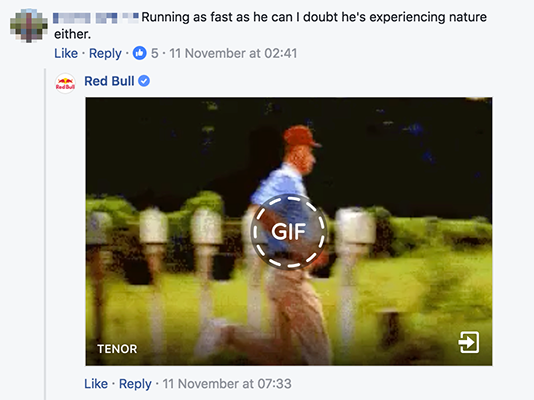 Red Bull is a caffeinated energy drink but take one glance at their Facebook page and you’d be hard-pressed to believe that. Instead, you’d think you’re looking at a sports brand. 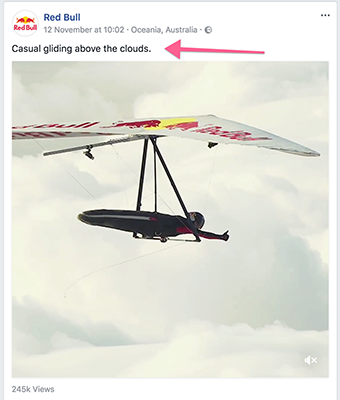 Red Bull’s Facebook page almost exclusively features images and videos (mostly videos) of atheletes engaged in extreme sports. This content helps establish Red Bull as a lifestyle choice, not just an energy drink. Their captions are usually very short – not even a dozen words – so the fans can focus on the videos. Also notice how the captions tie-in to their motto “Red Bull gives you wings”? All videos are hosted on Facebook, which makes autoplay possible. 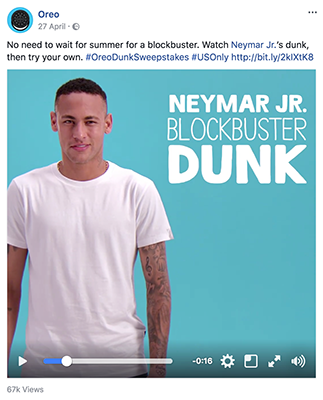 At the same time, Red Bull isn’t averse to sharing short GIFs. 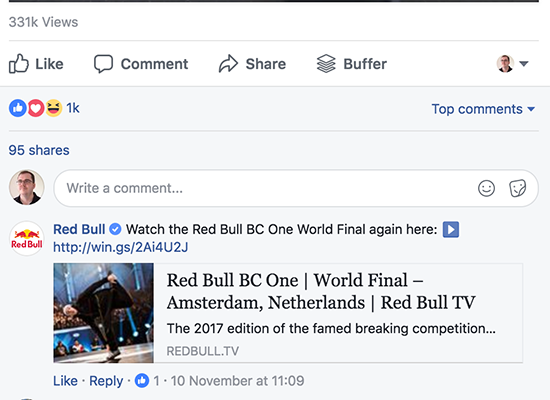 Red Bull frequently promotes its blog posts, apps, or other social media channels in the comments section of each video. This is pure soft branding – positioning Red Bull as a brand for adventurous, risk-taking people. The page uses a tone which will most likely grab the attention of its demographic: young males between 18-34. It works wonderfully well for a few reasons. They have stellar content that’s spread out throughout its various channels and they work with a lot of influencers that have substantial followings (in this case, athletes). 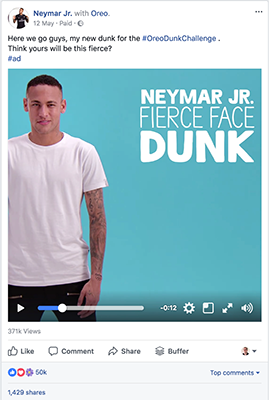 Video rules on Facebook. 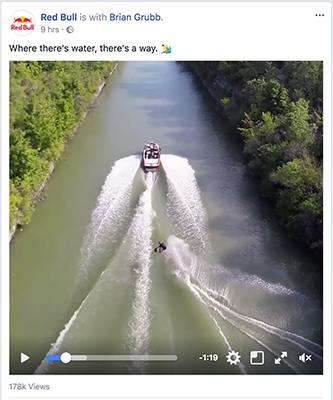 Instead of linking out to YouTube, upload your videos directly to Facebook to leverage autoplay. Never miss a branding opportunity. Something as small as a caption should tie into your brand’s tagline. Engage with people in the comments as much as possible. Leverage the use of GIFs and images in the comments – providing they fit with the tone of your brand. 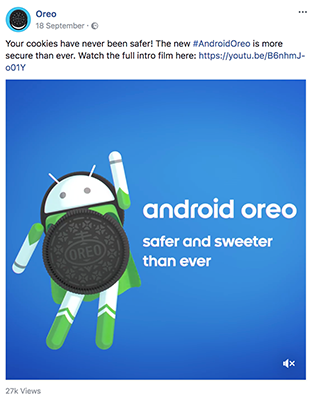 Oreo, the biscuit company, is a social media powerhouse with over 42 million likes on Facebook alone. 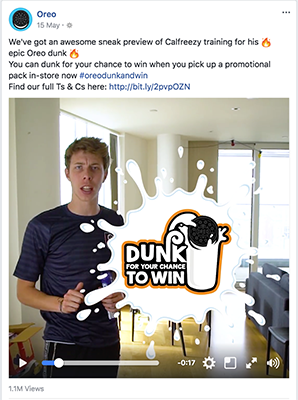 Part of this is down to Oreo’s use of contests and unique partnerships. This helps to show the brand’s fun side and make it more relatable to its target audience. Oreo doesn’t stop there. They take the idea of contests further and partner with influencers. And more recently, Oreo became the name given to the 8th version of Android, the popular mobile operating system. This is a great example of an ‘off the wall’ strategic non-competing partnership. And due to the popularity of Android, this will have a huge impact on the brand. And its worth noting how they only uploaded a teaser video to Facebook with a link to the full version on YouTube. This cross-promotion will encourage more of their fans to follow them on an additional platform. Run contests that align with your target audience and introduce them in an engaging way, such as through the use of video. Partner with influencers to expand the reach of your campaigns & gain social proof. Be on the lookout for non-competing brands that you could partner with. Big brands have big marketing departments and dozens of people managing their social media activity. However, that doesn’t mean you can’t use their tactics on your own social channels. Whether you want to grow your following so you can promote your blog, or you’re marketing a startup – we’ve discussed plenty of ideas you can use. Sharing content regularly, using innovative content formats, partnering with influencers and establishing your brand are all big-brand things you can get started with right away. In fact, because you don’t have as many constraints as big brands, you can be even more adventurous and try out completely new things. So use these ideas to put together a solid strategy and show the world what you can do!